'The sky is the limit for what all could be done at an air base to neutralise terrorists. Good proactive local leadership and delegated operational effort would be key to ensuring that a handful of terrorists cannot hold a whole air base, and by extension, the whole nation to ransom,' says Group Captain P I Muralidharan (retd). The terrorist attack on the Indian Air Force's Pathankot airbase makes one recapitulate on the important -- but at times ignored -- aspects of passive air defence/ground defence as it used to be called in our days. The task was generally orchestrated by the non-flying staff of an air base, which was inevitable as the aviators would be preoccupied otherwise during conditions of war. An elaborate standard operating procedure existed as to how the PAD sectors would be manned, air raid warnings, bomb disposal, water/electricity management, casualty evacuation, etc would be handled and this was periodically exercised by the station authorities and checked out by the Directorate of Air Staff Inspections. The IAF surely has come some distance since, what with its own Garud Commandos, essentially raised to undertake IAF-specific tasks including airfield security, commando operations within and outside the perimeter as also typical air warrior missions such as suppression of enemy air defence, combat search and rescue and the like. What has, however, changed dramatically too is the threat spectrum. Though the IAF has had aerially inserted paratrooper threats during the 1965/71 wars (some of them being neutralised by our valiant locals in Punjab and Haryana), the nature of terrorist threat as it unfolded in Pathankot is a different kettle of fish indeed. The nature of high value assets assembled at a fighter air base especially, as indeed Pathankot is, needs no gainsaying. Besides the war machines themselves, we have other key installations including the runway, air traffic control, command and control centres, fuel storages, bomb dumps, missile sheds, high-tech laboratories, specialist vehicles and the like which truly constitute national assets. The manpower (pilots, technicians, air traffic and other controllers, administrative and medical staff as also their families), of course, is also perhaps the most important strategic asset. All these ensconced in a vast forested campus (which comes in handy from the camouflage point of view but a nightmare for ground defence), a virtual military township comparable perhaps only to a large aircraft carrier militarily in terms of vital areas/vital points. The importance of ground defence understandably increases in a war situation as opposed to a peace or no war-no peace scenario. During war situations normally airfield security is augmented by the Territorial Army though this is invariably delayed and not effective. The luxury of getting regular army troops, leave alone the National Security Guard, is a far cry in an operational scenario. An airbase has to learn to manage by itself to handle perimeter and airfield defence. Proactive military leadership on the ground as well as new assets such as the Garuds need to be optimised to deal with the evolving threat spectrum, especially from terrorists and other anti-national elements. Much has been articulated in the media about the need for optimal command and control for undertaking such anti-terror operations in a military or urban environment. In the case in point, one understands from the media that the Air Officer Commanding-in-Chief of the Western Air Command was despatched to oversee the operations at Pathankot. And, of course, as is clear now, the NSG was flown in from Manesar, Delhi. Doctrinally, I think this is the worst way to conduct a tactical-level military operation. The operational control and accountability has to be with the local air force commander. That is why he has been put as the air officer commanding or station commander. Diffused or conflicting command/control can be highly detrimental to operational success. There have been cases in the past where local commanders have been replaced midstream during war, even in the IAF. That is an option always available to a C-in-C or the Chief. But good higher level leadership also means exhibiting faith in one's subordinates. Spoon feeding or micromanaging is not part of the recommended military leadership ethos. The minute details of the anti-terror operation are not known yet and may not be known for some years. Media coverage has indicated employment of attack helicopters and unmanned aerial vehicles. This is good news indeed. All available assets locally, aerial and otherwise need to be employed to neuralise the terrorist threat to installations and assets in quick time. Collateral damage aspects and other operational constraints need to be factored in. Depending on the behaviour of the terrorists and their weaponry, the local commander would have to employ his assets to achieve surveillance or hard kill objectives. Precautions such as control of media access, curbs on cell phone usage and evacuation or bunching of families and key personnel need to be planned. The air force has SOPs for these for war situations, but it may be prudent to work out new ones for this kind of anti- terrorist operations. Use of choppers and UAVs for perimeter surveillance night and day, especially during high threat occasions, should be sine qua non. For night operations use of search lights and flooding of underground structures may need consideration. The sky is the limit for what all could be done at an air base to bottle up and neutralise terrorist elements. Like stated earlier, good proactive local leadership and delegated operational effort would be key to ensuring that a handful of well armed terrorists cannot hold a whole air base, and by extension, the whole nation to ransom. Use of direction finding gear to zero in on local enemy agents and upgrade of local intelligence units such a liaison units and special bureaus of the Reasearch and Analysis Wing are other vital supportive anti-terror measures. Another important aspect in a terror attack scenario is evacuation of assets. The most important assets of course are the flying machines. The situation permitting they could be flown out to nearby bases. Defence of other high value assets such as ammo dumps and fuel storage would need buttressing. Incoming fuel and key stores would need to be temporarily diverted perhaps. Station authorities can locally augment medical assistance or heavy duty earth moving gear from local army/navy or civilian authorities. But all this needs careful factoring as across the board evacuations may not be advisable. Calculated marshaling of assets and replenishments would be called for. 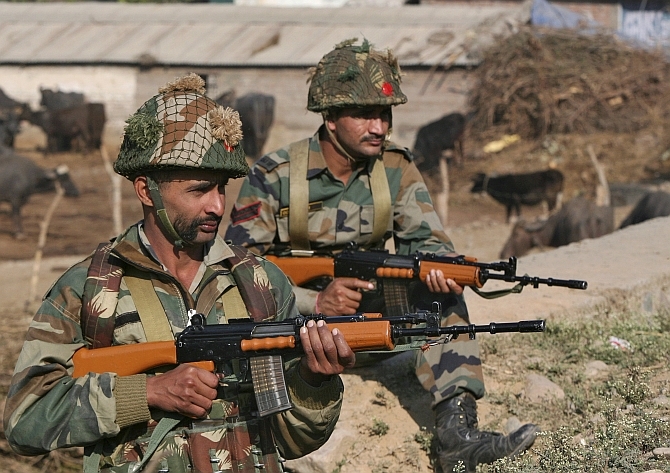 The Pathankot event appears to have caused a comparatively higher degree of casualties to our personnel. But one needs to understand that, besides the best preparation, a terrorist strike extracts a heavy toll in the target area, be it on civilians or other soft targets. Recall the high attrition of American personnel especially wherein suicide tactics have been employed by the terrorist elements. Only very highly trailed defensive/offensive assets such as the US Navy Seals or our own para commandos/MARCOS could neutralise such threats with minimal casualties. Another aspect that emerges in an airfield anti-terror operation is the uniqueness of an air base, especially a fighter base. Not only is it a 'target-rich' territory, but there would be several buildings, hangars and underground shelters to clear and protect. A combination of urban and military anti-terror operations so to say. Of course, the need to keep the media at bay and prevent undue pressure on local forces and increasing their vulnerabilities through real time coverage, need not be over emphasised. Timely media briefings at suitable locations need to be organised to cater to serve the requirements of public knowledge. One can understand how authorities at various levels choose to react in a complex democratic entity such as India. Recall the Kandahar fiasco and the much touted delays whilst reacting to the Mumbai attacks. So whilst the luxury of sending across NSG or the Western Command C-in-C may be condoned in this case, the lack of coordination or tactical oversights if evident post the entire operation would provide learning value. The IAF would need its own soul searching to address terror as a new threat paradigm. A while ago in a article about the need to reprioritise the IAF's role as missions ambit, I had advocated the need to tailor our force structure to address terrorist threats to IAF installations. Perhaps Pathankot reinforces my belief in this urgent requirement. The need to enlist the help of local villagers and police in intelligence gathering and physical security cannot be overemphasised. Having served two assignments at this key air base during the seventies and eighties (and having visited the base on private trips recently) the vulnerabilities of such a base to a coordinated terror strike are only too vivid in one's operational mind. How do we face future terror onslaughts? Katrina: Love is not easy!